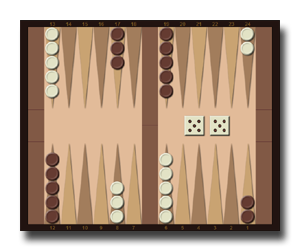 Backgammon is one of the oldest and established board games for two players. Two dice are using to determine how far the playing pieces (also called chips or checkers) can be moved each turn. The ultimate goal of the Backgammon game is to remove or discard all of your chips from the Backgammon board. Although some luck is involved and factors in the outcome, it is much more important to use solid strategy to win Backgammon games online. Backgammon is a very popular online game, and is perfectly suited for playing online. Playing Backgammon online is a lot of fun, and you can play multiple Backgammon games online at the same time with mutliple opponents. Come play Backgammon online with us! Sign up now to play backgammon online for FREE! © 2019 Backgammononline Inc. All rights reserved.